As it’s a new year I have decided to look into my crystal ball to see the future. Well, I DO live near Glastonbury, you know! It’s basically Wizard Central in the UK, and it's easier to buy a crystal ball than a carton of milk there. Looking into my crystal ball. Not. Oh, alright. I admit it. 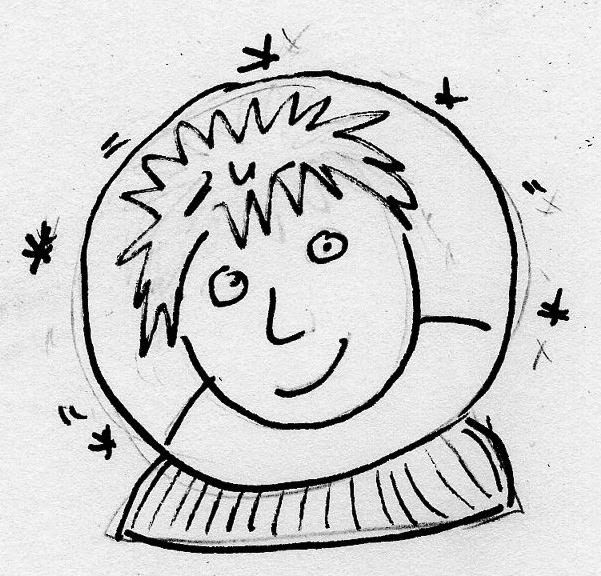 I don’t really have a crystal ball, so please don’t hold me to any of my predictions. In 2014 I foresee personal jetpacks, flying cars and houseworking robots for every home, obviously. That goes without saying. 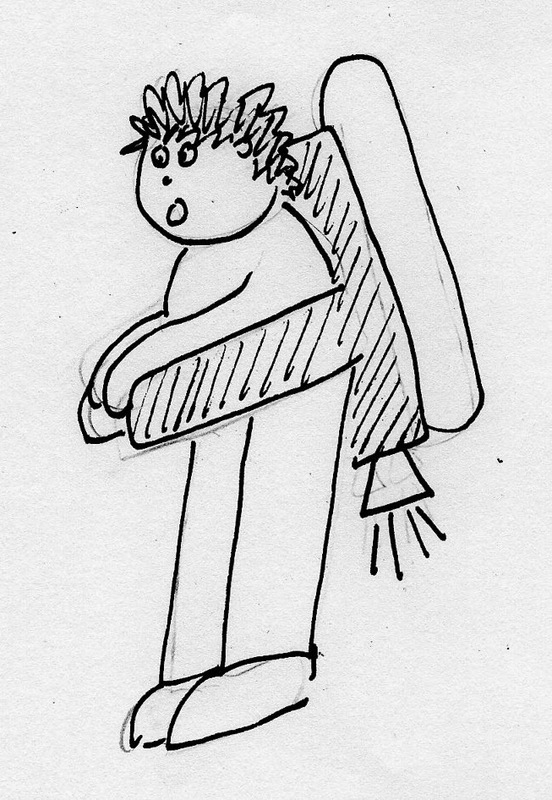 My personal jetpack, expected in 2014. But what about picture books? Now I will try to use my magic powers…..
1. I foresee more picture books connected to online sites or Apps providing extra material - not just e-book versions but all sorts of activities and extra words. This will be done in clever new ways, involving swiping or pointing a smart phone at some part of the book. Hopefully authors will be asked to help produce the online material, to make it imaginative. You may or may not wish to be involved, but I guess you need to be aware of whether you do or not when you sign contracts (I foresee getting a knowledgeable agent to blog about that side of things here on Picture Book Den in 2014). STOP PRESS; Since I did the first draft of this blog I’ve been asked to work on a series of books that connect to Apps, so that prediction has already come true for me. Maybe I DO have magic powers...Cool! 2. To compete in a digital age, books for adults are increasingly packaged with beautiful binding and cover effects to make them extra-desirable physical objects (check out the lovely new Gollancz Terry Pratchett Mort books being published in the UK as an example). Perhaps the same will happen with picture books. We may see more beautiful ‘must have’ editions of favourites, not just the usual paperbacks and board books. 3. We are already seeing more and more books reprinted with added physical extras –such as pressout card models excetera. Authors might like to spend a little time thinking of their own list of suggested extra elements and offer this creative thinking to publishers, if appropriate.They might ignore you, in which case no harm done, but I'd have thought they're more likely to be pleased. 4. I foresee publishers asking authors to make more and more personal effort to publicise their own work. That means being active online. It’s not easy, but we shouldn’t panic that we’re not on Twitter, Instagram, Facebook, Pinterest and Blatherbox (It’s ok. I made that one up). We should do what we’re comfortable with and have time for. We should try to add some kind of value to the digital universe when we can, and not simply ‘sell, sell, sell’. 5. I foresee more classic well-sold picture books being taken apart and reconstituted to create early learning ranges (eg: a counting book, a colours book etc etc). This is happening a lot. Nothing wrong with that, but it would be nice to see some more imaginatively reconstituted material in 2014. 6. The future of self-published digital e-picture books is very hard to predict. Amazon.com has been flooded with a tide of awful tat produced in the Far East, so it’s hard for professional independents to get noticed or make any money. I produced some bespoke ebooks in 2012 with Gerry Hawksley, but we were thoroughly demotivated in 2013 by the tat tide and by the capricious behaviour of Amazon. We have to get our mojo back on that one. Apps are very expensive for an independent author to produce, so it doesn't seem worth it. Sorry, my crystal ball has gone foggy here and I don’t have any predictions as yet. Perhaps there will be a gamechanger – a big 52-shades style hit that gets everybody thinking differently. Off to try my new wand. 7. I don't yet foresee a big picture book hit in 2014. That’s not because there won’t be one, but because it’s impossible to predict where it will come from. That’s a good thing, people! Keep writing! You are indeed a wise wizard! I had an email from a company today claiming it can turn my books into apps for free and I take any profit. Think I'll pass. I've held onto rights myself and would want to have at least some control over creative direction. I don't think anyone's doing 'book apps' particularly well yet - sometimes the production values are wonderful but the idea is still lacking. I've started making audio games to accompany my books, free to download. It gives me a tool to use at events and, I hope, adds value to the books themselves. But trying to get publishers to agree to add my URL onto covers as a contractual thing has given my poor agent a huge headache! Publishers want us to self promote but aren't necessarily up for moving with the times. Does your crystal ball foresee a boiling kettle, please? Time for tea. How interesting that publishers are resisting putting author URLs on books, Michelle. And yet they want us to blog and network on their behalf...Love the idea of audio games. It's a lot of effort for you, so you'd think the publisher would give some effort back. Re: book/app mixes, I hope to see some creative ones this year. I blogged a while ago about getting authors involved in the creative side of apps. It caused quite a storm, much to my surprise. I was told in no uncertain terms that it wasn't my business! I think you're wise not to take any notice of those e-mails from crappy app companies, by the way. PS: I don't mean Apps that are e-books, by the way. I mean physical books that lead readers to Apps by means of codes, magnetic ink, or magic for all I know - in the same way that those little square QR codes link things to the internet by means of a mobile phone. I expect to see a lot more of this in the kid's book world. Coo, what excitements ahead! I'd love to know more about your experiences with ebook publishing of picture books, Moira. A thought-provoking (and funny!) blog - thank you. Very mixed experiences, Pippa. That's for another blog on another day. Let's hope we all have nice surprises in 2014! Yes, there are big problems trying to get e-books marketed because there is a sea of dross to struggle above. I think we will see more mixed product coming through from publishers this year, though - physical books with built-in pathways to online material. There are really interesting developments ahead for picture books. I can understand that parents might be reluctant to buy e-book picture books, as they feel less tactile and 'snuggly', but the Apps are a different story! There are some fantastic interactive Apps for picture books, such as the wonderful App for Oliver Jeffers's The Heart and the Bottle (which is one of my favourite picture books anyway). Thanks for the great App tip, Abie! I'll be getting that! I predict more unpredictability. I have gone from having bestselling ebooks on Amazon (2012) to really not selling many ebooks at all on Amazon (2013), to forgetting all about ebooks and making things by hand to sell on Etsy (2014). I am very excited about what I am going to do next, whatever it might be! One thing's for sure, Gerry. You will always be a talented fella. 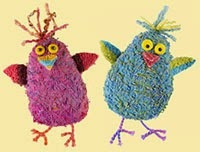 Gerald, I just looked up Etsy - what a wonderful resource, thanks. Moira, I've stared into my crystal ball and five years from now I've seen book apps that are as easy to produce as websites in 2014. However, I have no fortune-telling genes in my blood, so my prediction may be suspect, but it feels logical. 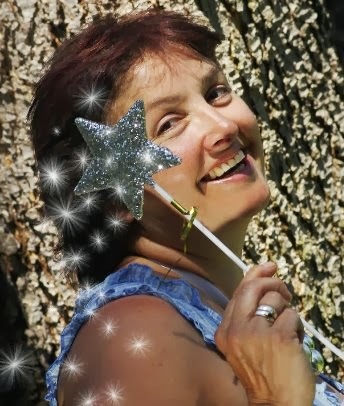 By the way, Moira, I adore the photo of you with a magic wand. Lovely! That'd be a really interesting development, Paeony. The difficulty is always the mountains of rubbish that gets pumped out, but hopefully the cream will rise to the top. Gerry tells me that even on Etsy (where craftspeople from around the world sell goods) there are now lots of suspect products that are not handmade at all. It's the Wild West out there! Me again! Sorry - This has started me off thinking all over again. "five years from now I've seen book apps that are as easy to produce as websites"
You can produce interactive content as easy as producing a website here ( a $29.99 application) http://tumult.com/hype/ and then make it into an app using this http://bakerframework.com/ (it's opensource and free). Only drawback is it's Apple only. Actually, I might give it a try myself. Thanks, Moira, I'm starting to get enthusiastic again! Interesting post. I must look at some more recent apps, as the ones i tried a year or so ago were just gimmicky nonsense a lot of the time. Even the of award winning ones I looked at. (Just like CD roms were for the most part, way back when.) Let's hope the good ones, where the bells and whistles actually help the story, not distract from it, will succeed in future. I think kid's apps, conceived as apps rather than as repurposed books would be a better idea. Truth to materials! I woke up with a new prediction! One day in the future children may be able to go to their local 3d printer shop with their book and some kind of code, to get a 3d figure of their favourite character.